2012.02.27 米は偉大だ! / Rice is mighty!!! 2012.02.25 なぜベストを尽くさないのか / Why don't you do your best? It was fine day again. 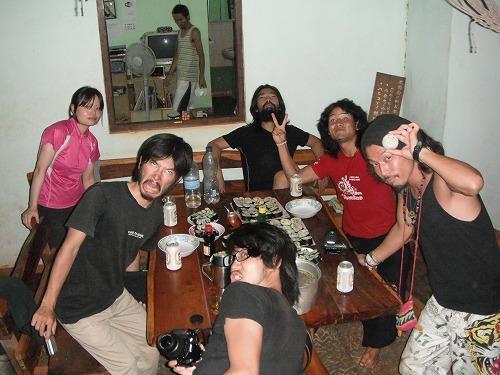 Unfortunatelly my friends Yasu, Takuya and Masa (the Guru) were to leave today. As they were leaving after lunch, we went to grocery shopping. 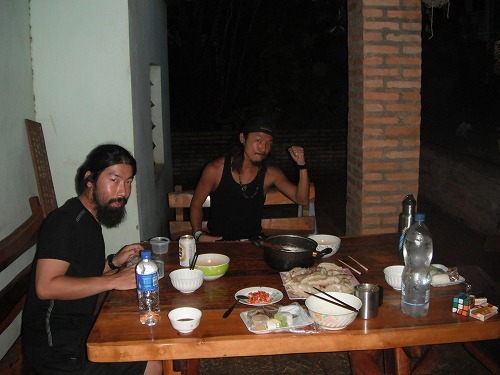 Shin and Taku were in charge of cooking. They made stir fried vegies and chorizos. It was served with a soup. Recently our cooking skills are getting better and better. Those 3 left the hostel after lunch. It's sad to say good-bye to my friends but, hey, we are the travellers! We must keep going. 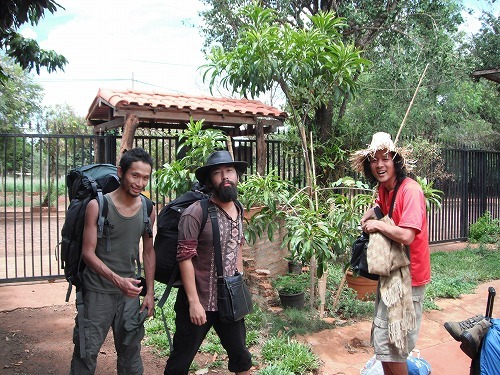 Yasu and Takuya had already bought their bus tickets, but Masa - the Guru - had no ticket yet. So there was a great possibility that he would come back here as the bus to Buenos Aires could be fully booked. In the afternoon, there was a blackout. We spent time chatting, studying Spanish, drowing pictures etc. Then the Guru returned! He could not buy a ticket to Buenos Aires for today. Rather no seat was available until wednesday. Everyone was happy to see him again. This evening, we had to make dinner for 10. Iku, Emi and Taku were in charge of cooking. Stir-fried egg plant and minced beef in miso based sauce they cooked. Well-done guys. Well, I have been staying at Pension Sonoda for 2 weeks by now. I am semi ship-wrecked here. But I am editing my blog, meeting new friends, chatting with them and son on here. I am having good time indeed. ********************************************************************************************************************************************* I joined the "World trip blog ranking" Please click the button! 米は偉大だ! / Rice is mighty!!! It's a fine day! It's gonna be a hot day. As it had been raining for a while, I did landry in the morning. Today's main event would be having "Hiyashi-Chuka" (literally means chilled Chinese noodle). Well, how can I discribe this in English. This is a chilled egg noodle served with cold vegies (cucumber, tomato, shallot, etc), boiled egg (half), ham, and soy sauce based special sauce. In Japan, traditionaly this dish is only served in summer. 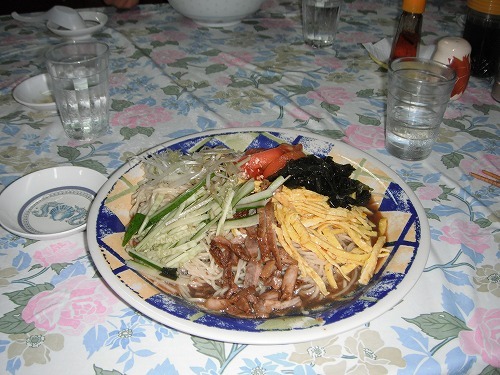 Actually, every time I went back to Japan, "Hiyashi-Chuka" is not on my list of "Must have foods while in Japan". But as it is a hot day and the restaurant only serves Ramen (hot soup noodle) and Hiyashi-Chuka, I would prefer having icy cold Hiyashi-Chuka. Everyone else ordered Ramen, but I ordered Hiyashi-Chuka. 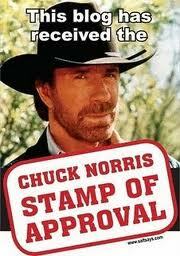 It was excellent! I would put this in my list now. 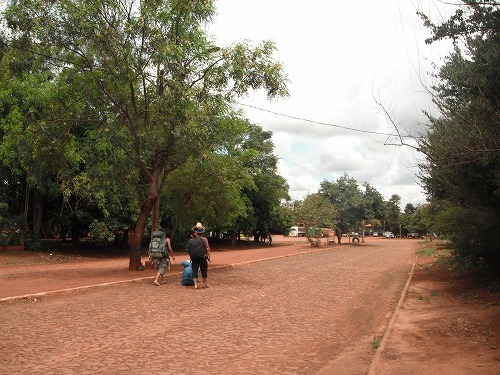 Back to the hostel, I continued working on changing the design my of my blog. I changed the design last night but it is still not perfect. How do you think about the new design? In the afternoon, 5 more guests arrived. Now we have 14 guests. It's almost full house. But we faced a huge problem. None of shops opens in sunday afternoon. We had no much foods for dinner. 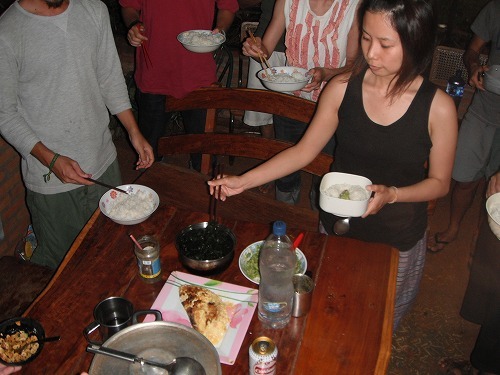 What we had were - 5kg of rice, 1 avocado, 9 eggs, 1 onion, 1 cabegge, some garlic, seaweed and some seasoning. With these ingredients we had make dinner for 14! But we used our brains and end up with having bariety of dishes on the table! Well done everyone. 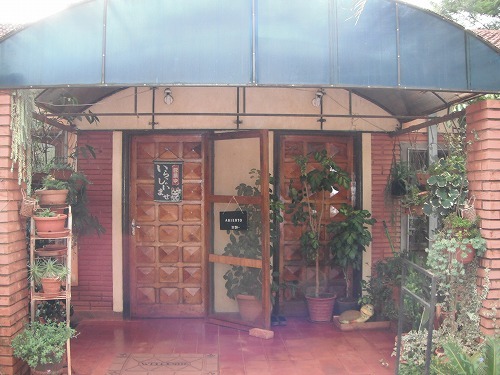 Pension Sonoda @ Colonia Yguazu, Paraguay. Here is my home. 皆でわいわい食べるうどん。最高です。麺の出来具合もヨシ! ありがとうアキさん、そしてGood team work, everyone!! The reason why I joined "RWT blog ranking" is that I would like more people to read my blog. So I could send my message to wider public; hence, I might get more supports to the "Japan Revolution" acts. As many web surfers would check the ranking now and then, if my blog is ranked high, it would have more chance to be read. Not just keeping blog everyday, I could utilise my blog as acommunication tool to mass public. Today is saturday. We had been waiting for this day. Why? 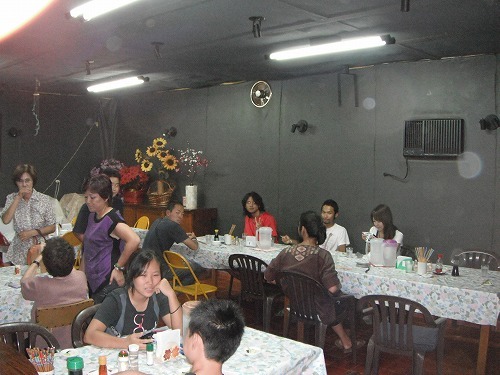 The ramen (Japanese style soup noodle) shop opnes only on saturday and sunday. 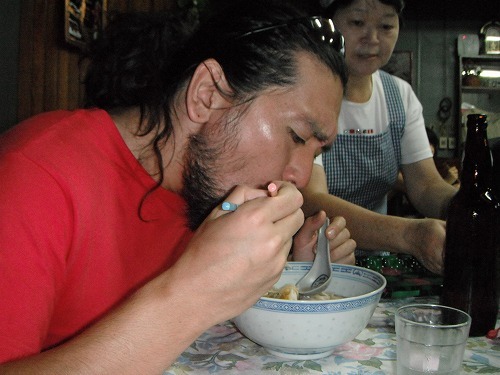 It is really hard to have good quality ramen offshore, so we could not miss this chance. He will visit Australia soon. I guess as he had such bad luck, he will have great days in Aus. I also broke my heart on the day, so I felt the same pain. Buen viaje mis amigos! Usually it is hard to get a proper ramen outside of Japan. But ramen here was pretty good. 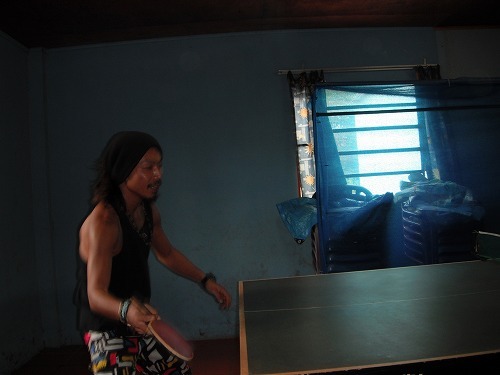 Aftre lunch, Aki invided us to his place and we played teble tennis. Actually he was the representative of Paraguay. No wonder he is a good player. 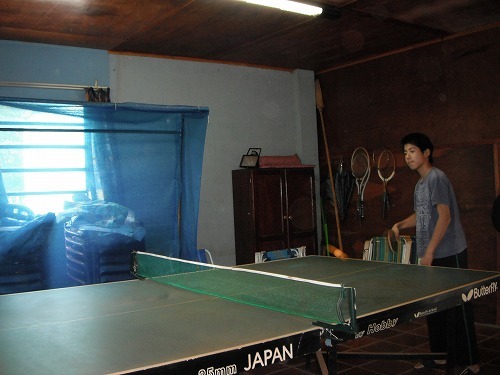 Shin was the best player among us, but he was no much with Aki. We planned to make Udon tonight. Aki offered to make Udon noodle. So the rest of us went to buy ingredients at the supermarket. 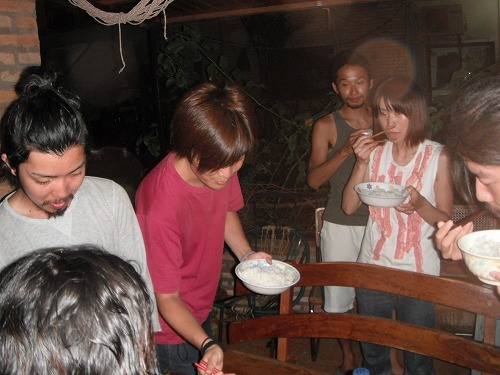 Back to the hostel, there were 2 more guests - Ikuko and Emi. So we had to make more noodle. As we found flour at the "Free" box, we made extra noodle. Total of 14 people at a table. 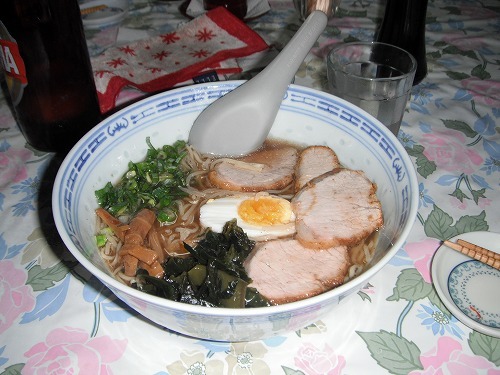 The noodle Aki made and we made were excellent! Having the same foods with lots of people, priceless! なぜベストを尽くさないのか / Why don't you do your best? The weather was not good from the morning. 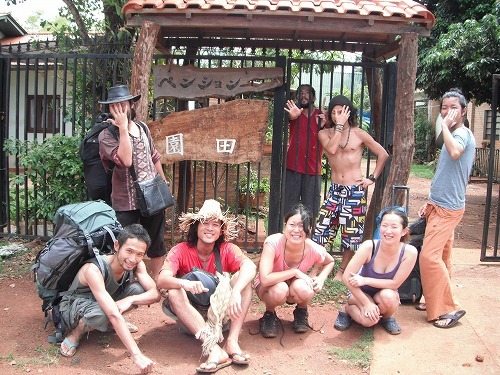 But Kimi and Take went to the Falls of Iguazu. Hopefully they would have a good day. 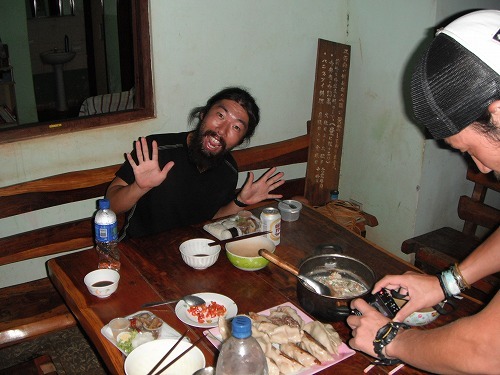 A new comer - Takuya - arrived at the hostel. He is a friend of Shin and I heard about him from Shin before. As we had to use left over ginger soon, we cooked "Stir fried pork in ginger sauce" for lunch. As the flame of the stove was not powerful enough to stir fry pork and vegies, it became "steamed pork and vegies in ginger sauce". But the result was pretty good. 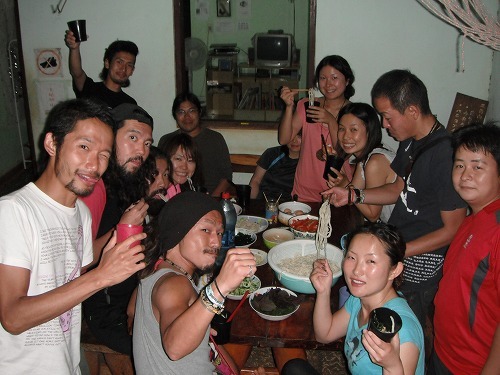 Another new guest - Tomoyo - just came to the hostel, so she joined us for lunch. It started rain really really hard in the afternoon. 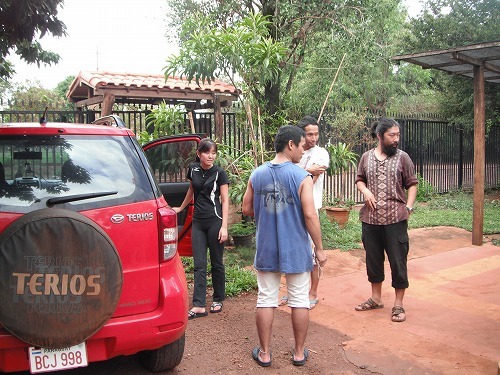 But 3 guests - Chika, Uraken, and Norida left to Ciudad del Este. Have a good trip! Shin was eager to make sushi tonight. But as it was raining hard still, we could not go to the supermarket. Fortunatelly, Aki - the manager of the hostel - gave us lift to the supermarket. Thanks Aki! There were 11 hungry stomaches to fill tonight. We made Teriyaki Chiken rolls, Egg rolls, Cucumber rolls, Tuna rolls, Mix rolls, etc. Sushi vinegar was provided by Pension Sonoda! Thanks so much. Shin and Takuya tried to fix it with glue. But as they were really drunk, the end result wasn't pretty.